From the Nephilim and Goliath in the Bible to the Titans in Greek mythology and the Fomorians and Frost Giants in Celtic and Nordic lore, almost every culture around the world has spoken of an ancient race of giants. Giant footprints left in the geological bedrock, tens of thousands of years old, have been discovered in India, China, and the war-torn lands of Syria. Giant bones and full skeletons have been found in Europe, the Middle East, Africa, Australia, and Asia. Yet despite mounting evidence, mainstream science continues to consign these findings to the fringe. Examining global myths, historical records, megalithic ruins, and archaeological findings, Xaviant Haze provides compelling evidence for a lost race of giants in Earth’s prehistory. He explores myths that go back thousands of years, including those found in the world’s holiest scriptures, as well as medieval and modern myths, such as Geoffrey of Monmouth’s account of the first kings of Britain and the stories of giant bones unearthed by Allied soldiers during World War II. He investigates historical reports of ancient giants found in Ireland and the British Isles—the remains of which mysteriously disappeared shortly after their discovery. He explores the legends of giants in Russia and goes deep into the Far East, revealing the multitude of fascinating giant legends in China. Haze explains how giants were responsible for the megalithic wonders of Malta and how the early settlers of Australia discovered the remains of giants but these findings were suppressed by the Royal Academies. He also explores the mythic origins of the giants: Were they the hybrid results from genetic experiments of ancient aliens or from the interbreeding of the fallen angels with the daughters of man? 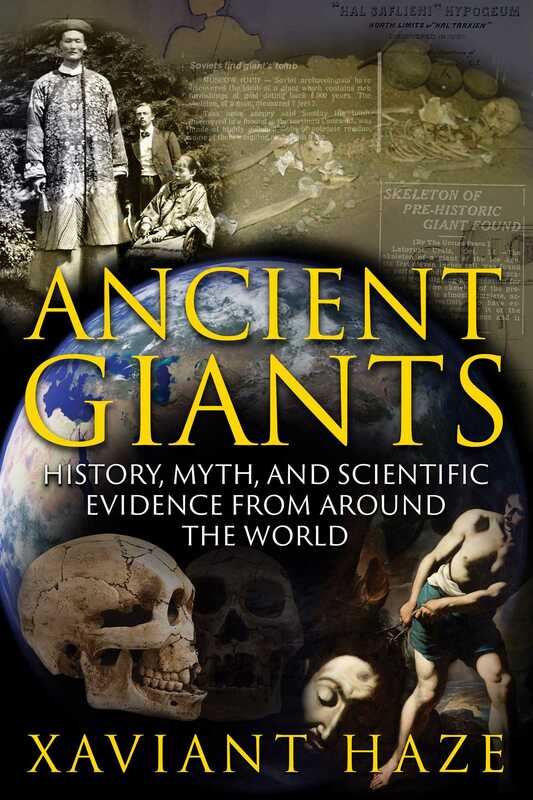 Covering legends and finds from throughout Europe, the Middle East, Africa, Australia, New Zealand, and the Far East, Haze also presents--in its entirety--The Book of Giants, a portion of the Dead Sea Scrolls suppressed due to its overwhelming support for the existence of giants in antiquity. The skull of this giant was supposedly big enough to hold the skull of a normal human just in its mouth alone. According to local Maori legend these giants were known as the Te Kahui Tipua and had perished in a great flood ages ago. Most of the discovered giant bones were found in New Zealand around the vicinity of the city of Timaru. Numerous reports of these giant skeletons of the Te Kahui Tipua were found up into the twentieth century, however, like in most cases, the bones have all gone missing, and all we are left with are the initial reports of their discovery, like the giant bones found in a cave near Port Waikato. Kept alive by an article in N.Z.Truth dated September 29, 1965, (2) this pair of giant Maori skeletons has also mysteriously vanished. In New South Wales, the fossil of an Australian giant was discovered near Bathurst, alongside huge stone tools and hand-axes of tremendous weight and size. The fossicker that discovered the ancient haul believed the bones belonged to somebody that could have been up to twelve feet tall. This discovery reaffirms the aborigines’ beliefs that there once existed on the Australian continent a giant race of tool-wielding hominids who preceded them by thousands of years. According to indigenous Australian beliefs, the Giants of the Dreamtime were a race of giant hominids that roamed the Australia continent long before the appearance of the first Aborigines. Australia is also home to 20,000-year-old human footprints and just recently Cretaceous dinosaur tracks were found on Broome’s Cable beach in Western Australia. As for the ancient Australian giants they are survived by their massive stone tools, giant molars, and in the monstrous footprints they left fossilized into the rocks of down under. The Solomon Islands, an island archipelago near Papa New Guinea in the South Pacific, has an interesting history of giants as well with astonishing tales both ancient and modern. According to local reports, and the research of writers like Marius Boirayon and Jonathan Gray, it’s said that giants still live inside the vast cave systems running underneath the rainforest mountain ranges of Guadalcanal. Could these accounts of modern giants be true? The mountain ranges of Guadalcanal have been attracting prospectors since the 1970s when gold was first discovered there. By the late ’90s the Ross Mining Company had a monopoly over the local gold-digging business and were in the process of bulldozing an area in northern Guadalcanal when one of their huge bulldozers broke down. Leaving the ten-ton blade behind, the workers hauled the bulldozer back to the workshop and promptly called it a night. The next morning when bulldozer and crew returned to the site they were astonished to find that the ten-ton blade had vanished! Everyone on the team was in disbelief. How could such a heavy object vanish without a trace? A search party for the blade was soon organized and after about twenty minutes one of the workers discovered a trail of giant human footprints leading up to a small hill with a cave entrance opening. The footprints ended near the base of a cave and the mammoth blade was discovered discarded about a hundred feet away. These were the same living giants that former Guadalcanal Premier and Finance Minister, Victor Ngele, fatefully encountered during a scouting expedition on Gold Ridge. But bad weather and a slippery road left their Toyota Hilux 4WD truck bogged down off the road in the mud. With their vehicle unmovable and stuck, Ngele and his companions made the trek back to the nearest village for help. When they returned they were surprised to find their Toyota back on the road, but even more shocked to see two giant fifteen-feet-tall men standing on each end of the muddied truck. In fear, everyone scrambled away from the Toyota with the giants dashing into the forest and Ngele and his crew returning the way they came. About a half hour later after summoning the courage to return to the site, Ngele examined the giant footprints and determined that the two giants had picked up the truck and placed it safely back on the road.